Have you ever felt hopeless? Have you ever longed for joy but it seemed just beyond your grasp? Have you ever wondered what role you play in receiving peace, joy, and hope for your daily life? Then let me introduce you to my sweet friend, Lauren Gaskill. Today she shares her testimony of being in that same place, and how she overcame. This situation is hopeless. Who am I kidding … I’m hopeless. Absolutely hopeless. Hot tears streamed down my face as I walked out of the doctor’s office, and I could taste the bitter salt as they entered my mouth. Whispers echoed all around me, but I kept my eyes on the asphalt beneath my feet. I wasn’t looking for anyone else’s pity — I just wanted to go home. With shaking hands, I opened my car door, put the keys into the ignition and blared Adele’s “Hello” to drown out my wailing. First anxiety. Then depression. Now a connective tissue disorder and degenerative joint disease? Oh Lord, what more could go wrong with me? I cried, prayed and begged for healing and deliverance, but neither came. And so, with each passing day, my faith, hope and joy dwindled as my health continued to decline before my eyes. I can’t tell you the exact moment it happened, but somewhere along the way I lost sight of the hope that I had once had in Christ. 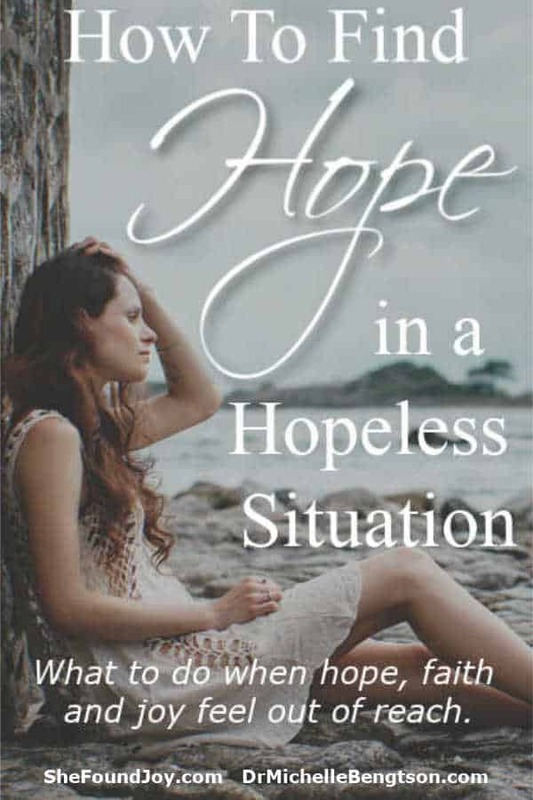 Keeping faith and hope alive can be a struggle when our circumstances make us feel like life is hopeless. For me, with that sense of hopelessness came a slow and silent hardening of my own heart. It’s not like I woke up one morning and instantly felt cold, sad and bitter toward the world. I didn’t want my heart to become hard … it just happened. The more I dwelled on the mess of my life, and the more I forgot to cling to God’s promises, the harder my heart became and the harder it was to find hope and joy in the everyday. When anxiety, depression and chronic pain crippled me, I stopped looking for the good in people and situations. And as life sent me disappointment after disappointment, I stopped expecting things to work out. Instead of focusing on what would go right, I focused on what could go wrong. When life didn’t get better, I wallowed in my brokenness. I wonder if you’ve ever felt the same way. It’s been nearly three years since I ran out of that doctor’s office. In those three years, I have dealt with seasons of anxiety and deep depression. I’ve wondered if I would ever experience joy again. But, by God’s gloriously overwhelming grace, I have also found faith, hope and an everlasting joy that circumstances will never take away. In the middle of the raging sea that had become my life, I looked up and realized I was sinking beneath the surface. 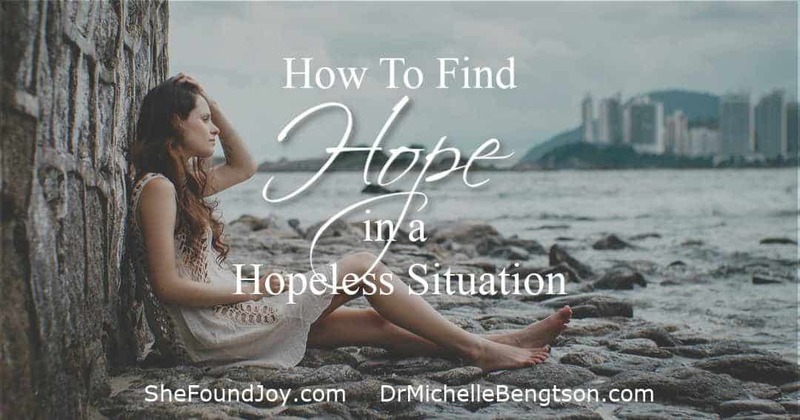 I didn’t know how I was going to bring hope, faith and joy back into my life, but I knew that if I didn’t reach for help, my life truly would remain hopeless. And so, I started reading the Bible again. I started asking God to change my heart. Over and over again, I prayed these words, determined to finally start seeing beyond the struggle — to walk away from the darkness of hopeless living and into the light of a hope-filled future. I’ll admit, some days it felt like I was taking one step forward and two steps back (goodness knows I still feel like that sometimes on this faith journey), but as I opened my heart to the possibility of a better tomorrow, God began to transform my mind, heart and soul. Does hope, faith and joy feel out of reach today? Beloved, do not lose heart. Take courage. Reach for Jesus. Cling to His Word and what is good. Push back the dark and choose to see beyond the struggle. Seek help. Ask God for what you need. I know the waves around you might seem scary, but you’re not going to drown in them. No, the only thing God wants you to drown in is His love as you dive deeper into a life of courageous faith in Him. Lauren Gaskill encourages women to go deeper in faith and live in joy, regardless of life’s circumstances. She is a devoted wife and fur mom to Reese, who she named after her favorite candy, peanut butter cups. Her first book, Into the Deep: Diving into a Life of Courageous Faith releases this fall. 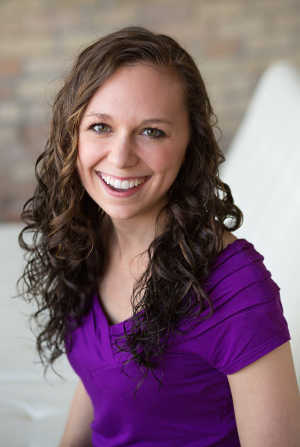 Lauren is also the founder of She Found Joy, a nationwide events-based ministry encouraging women to discover an authentic joy in Jesus, live it consistently and give it abundantly. You can join Lauren and other prominent speakers for a night of food, fellowship and fun on the national She Found Joy Ladies Night Out tour, coming to eight cities this fall. Thank you, I really need this today. God bless you. I’m so glad this post blessed you! Because of Him, #HopePrevails! Good morning, dear Jeannie. I am so glad God could use this post to touch your heart today. Blessings and joy to you. I so needed this today. I have chronic pain in my feet and knees. Standing for any time is so hard. I get depressed and down very often. Having to use a walker or crutches 24/7 gets exhausting. This ministered to my spirit. Thank you so much for the hope I felt reading this. I’m so very sorry for your pain. Even as I type this, I struggle with severe physical pain. Sometimes I think it just helps to know we aren’t alone and that others understand. But even when they don’t, we have a God who does and He catches every tear. Because of Him, #HopePrevails! Dearest Kathleen, I am so sorry to hear about the pain you are experiencing. Like Michelle and yourself, as I type I am having a pain flare up in my right knee and shoulder and left jaw. I, too, am thankful he catches every tear. Nothing is wasted, and I hold on to that promise, along with His promise of better days to come. Hugs and much love to you. It is very possible to feel overwhelmed or like you are drowning, reach for Jesus, the best thing to do. Reaching for Jesus is ALWAYS the best answer. So grateful He is always waiting to take our hand. Because of Him, #HopePrevails! What a blessing you are! Thanks for sharing this. 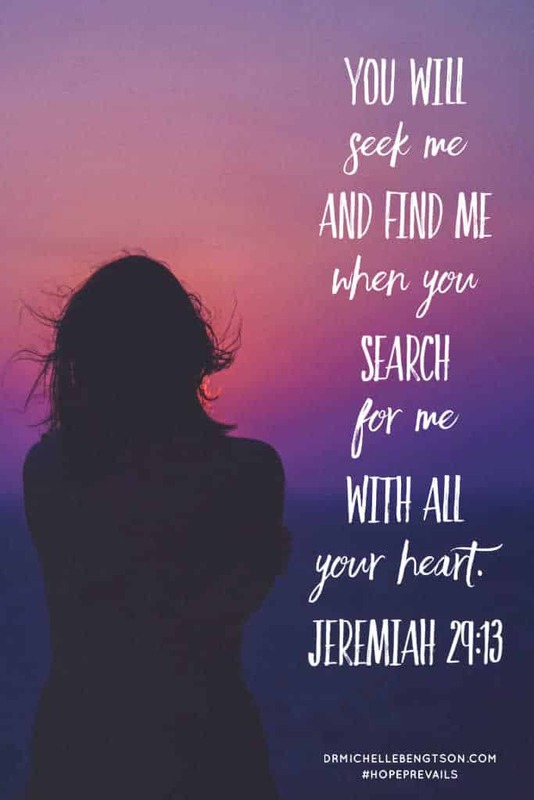 I love the verse about finding Jesus. He is ALWAYS THE ANSWER! I have to examine myself over and over again about searching “with all my heart”. When I don’t know the answer, I oftentimes try to fix things myself. It seems to hurt less when I surrender it all. God bless you. Kim, I think you are in good company. So many of us grow impatient when we are waiting on God’s timing, and try to fix things ourselves. But you are so right, it always hurts less in the long run when we surrender it all to Him, trust His ways and His timing. God bless you! Thanks for visiting today. I hope we see you here again for more encouragement. Because of Him, #HopePrevails! I found this to be so encouraging. In addition to having fibromyalgia and arthritis, I have been living with constant, excruciating pain for the last 18 months which recent surgery has only worsened. It is so difficult to keep believing that this is part of God’s plan and that good will come out of this. I am grateful tho for my patient and loving Christian husband who walks this journey with me. We are in our late 60’s and have been married less than 3 years… Praise God for the encouragement He gives us through others!!! Oh Rochelle, how I empathize with you. I too had severe pain which surgery only worsened. I look forward to the day when there will be no more pain, no more tears, and we are healed and whole. I’m so glad Lauren’s post blessed you. Consider that Father’s hug for you today. Because of Him, #HopePrevails! We went through what seemed like a hopeless situation last year but God is faithful, we just kept our focus on Jesus. What a great testimony. The Word says that he will keep in peace those whose minds are fixed on him! Peace and blessings to you. Thank you to both of you for sharing this. It was very encouraging. Jeremiah 29:13 is a special one to me. It’s the verse that pointed me in the right direction at one point in my life. Thank you, Lauren for sharing this! Thank you for this reminder. I have my own health issues and deal with many health issues in my family. Sometimes it is really hard to look beyond them. I can relate. I’m so grateful that God dries every tear and sends others around us at just the right time to be his hands, feet, and words of encouragement. Thank you for your beautiful post and your willingness to be vulnerable. I am on the other end loving those that struggle with some of the same things you have. Your words have helped me to understand a little better what its like to feel hopeless and hopefully I can offer better help and more empathy. Of course I am not immune to feeling hopeless at times too. Yes, Jesus is the way. DrMichelle – Thank you for sharing Lauren with us today and posting on Grace & Truth Christian Link-Up. Blessings to you as you care for loved ones. I, too, have been a caregiver and know the toll it can take. Isn’t is great to know that He promises to be our strength? Blessings to you as you share His help and hope! Because of Him, #HopePrevails! Thank you for sharing this story, Lauren and Michelle for hosting her words. It does feel hard sometimes when one thing after another goes wrong, but if we can focus on Jesus and not on our circumstances we can find peace and joy even when things are bad. Even when we fall into depression and all seems hopeless, God is still there waiting patiently for us and holding us up when we don’t even realize. Blessings to you, Lauren and to you, Michelle! It’s so true that the key is focusing on Jesus rather than our circumstances; that’s where our peace resides. Because of Him, #HopePrevails! I’m so sorry for the difficult trial you and your husband are enduring. Father, I lift up Lureta and her husband to you. Ease their pain and suffering Lord. Hide them in the shadow of your wing. Let them find refuge and comfort in you. You promise to work all things for our good and I pray that what the enemy intended to harm them, you will use for good and for your glory. In Jesus’s name, Amen. As a major depressive disorder sufferer, I can fully understand the black hopelessness that you wake up one day and discover is the lens that is coloring your world. Jesus is so faithful and when we reach out for Him, He’s always there. Can you imagine how much it hurts Him to see us so distressed? Especially when He is within reach all the time. I’m so sorry you went through this terrible time where you felt so alone. I’ve been there and I can fully relate. God bless you as you recover from it! So grateful for God’s faithfulness. He never leaves us, even when we feel alone and lonely. Because of Him, #HopePrevails!